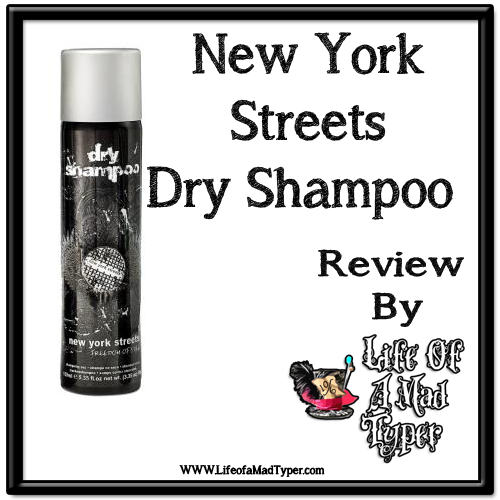 I received a can of New York Streets new Dry shampoo. I was interested in trying it out as dry shampoo is something I try to keep on hand and I have tried a few that were a little less than successful. Depending on the time of year I could wash my hair and its oily by the end of the day. Other times I would like to freshen up on the day that I don't wash my hair. I wash my hair every other day to prevent it from drying and frizzing. Ever have a day when you woke up late and just no time to wash your hair but it needs some spiffing up? Dry shampoo is amazing to keep on hand for the OMG days. It also helps people that have recently had to have surgery and can't take a standard shower and would like to keep their hair presentable. New York Streets has products for your every need. Find New York Streets online.